Perhaps the last camping weekend of the summer has passed, and I must say, I think we're about getting it right (with the exception of a few drips of rain through the tent at 0400, and why does it always happen at 0400?). 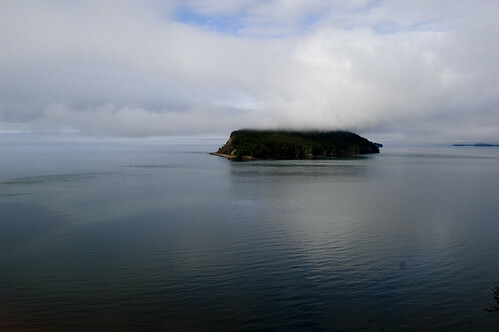 Five Islands Provincial park is on the shores of the Minas Basin, home of some of the highest tides in the world. What this means is that the tide goes out (and comes in) very quickly, and moves a great distance. You can find yourself walking for half a mile or more to just get to water, and when it turns and starts to come back in, you'd better know where your sandals are or be ready to give them up to the sea. We'll remember this trip as the place that's fantastic for sunsets and clam-digging and mudflats, but not so sensational for swimming. The Lovely Wife and I stayed in this very same campsite (Campsite #69, the one The Brits had indicated to the check-in girl that I would DEFINITELY want, and not the adjacent #68 which they got) a few years earlier, and in this set you'll see that I was trying to duplicate a sunset picture. I may or may not have got it right here - only time, and some hard drive searching, will tell. Looks gorgeous there. I am envious. Hey Mike - five islands is beautiful, we camped there a few years ago too. Meg left a note on my blog page to email her and I sent a couple of messages last week, but I'm not sure if she received them. Can you let her know that I'll send a note to her facebook email? Thanks. Btw the kids are as cute as ever! !